In early September, with British general William Howe’s troops advancing toward Philadelphia, George Washington deployed his army along the east side of Brandywine creek, about 25 miles from Philadelphia, and took up a defensive position to meet the British. Washington was expecting the British to launch a frontal attack, and at first, that’s what appeared to be happening, as British troops congregated on the other side of the creek opposite Washington’s center. However, Washington received intelligence that a large force of the British army was heading north to cross the creek higher up and outflank the Americans. So Washington sent out orders to reposition his troops to meet the threat. But before the orders could be fully carried out, Washington received conflicting news that there were no British to the north, and he rescinded his orders. But it turned out that the original intelligence was correct, and there really was a large force of British about to outflank the Americans. Washington hastily repositioned the right wing of his army to meet the British flanking maneuver, but the Americans couldn’t withstand the British attack. Washington tried to reinforce his right with troops from the center, but it was too late. At about the same time, the British at the Americans’ center also attacked and likewise overpowered the Americans there, and the American army was forced to retreat. During the battle, the Americans suffered an estimated 1,300 casualties, with approximately 300 killed, while the British sustained 583 losses, with 89 killed. The Americans’ loss enabled the British to take Philadelphia without a fight later that month, and the Continental Congress, which met in that city, was forced to move to Lancaster, Pennsylvania, for the time being. Despite their defeat, the American troops remained in relatively good spirits, seeing their loss as only a temporary setback. However, Washington’s failure caused some Patriot leaders to question his skills as a commander. Did you have ancestors who fought in the Battle of Brandywine? Tell us about them! Or search Fold3 for additional information about the battle. My 3rd ggf, Samuel Henderson, was a private in the 9th Regiment, North Carolina Continentals, under COL. John Williams, a co-founder of Boonesborough. The regiment fought at Brandywine and Germantown and was disbanded at Valley Forge in June 1778 . What part of North Carolina? My G X 4 was out of the Wake County area. I am hoping to obtain facts related to any battles he and his brother might have participated in. The family was from Granville County. also from North Carolina In my family tree. There were a lot of Samuel Hendersons in NC around this time. I thought yours might be the son of Samuel, born 1700, but on checking I find his Samuel was born in 1742. Sorry, Betty, my Samuel was born in 1759. Samuel was a very popular name for the Hendersons in this period. There are a bundle of them. My GGG grandfather, Samuel D. Davis, born in 1761 in York Co. Pa, was only 16 years old when he went to the Pennsylvania militia in place of his ailing father. He fought at Brandywine, and spent the remainder of his 6 months guarding British prisoners taken at that battle. My SAR ancestor, Isham Blake, was an eleven year old fifer in Gen. Washington’s staff during Brandywine and later served on Lafayette’s staff as his personal bodyguard in 1780-1781 during the Virginia campaign and was with him at the surrender at Yorktown. They were re-united for an evening during Lafayette’s 1824 tour of the U.S.
Did you say 11 years old? If so, he would be a great research project. Volunteer? Conscript? Forced? My goodness I can see 15, but not 11. And no they were not old for their age. Done too much research that confirms that! Sometimes kids went with their parents to war–father, son, and wife following camp. Some kids had nowhere else to be. Of course camp followers. I know it was mentioned on the 3 or 4 part series based on Bill O’Reilly’s latest novel that one of the women would go out on battlefield to deliver messages along with food or whatever. I want to say Molly Pitcher is what they called her. The opposition would not fire if she was there. Try that now and you’ll get your head blown off. What happened to chivalry? Oh I know we joined the Army! Martin Adolphus Eberhart my 5th great Grandfather helped carry a wounded Lafayette off the battlefield at Brandywine. Roberta, I like your vivid description of the Battle for Brandywine. My 5th great grandfather, John Mathias Flach (Flaugh) also fought at the battle of Brandywine, according to his pension file S10995. I was accepted into the DAR due to his service. Mathias came to the colonies in 1773 aboard the Union from Rotterdam as an indentured servant, he was originally from Rimhorn, Baden in now Germany. He enlisted in July of 1776 and served in the German Regiment of the Continental Army under Captain George Hubley (1776), Major Burchardt (1779), and Colonel Weltner (1780) for the duration of the war. His pension lists Trenton, Monmouth, Brandywine, and Germantown as the battles that he fought. Mathias was also at Valley Forge with the army. Jan’y 20th 1834: age 81 yrs, 9 mo. 12da. I now live in DE but am visiting old friends in STL as I type. Seeing Peg Flach (her birth name) on Tuesday and will show her this. She may not be descended from John Mathias as there a gaggle of 1840’s Germans out here. It she thinks she maybe I will let you know. My people where in southern NY but I will be honoring the Battle of Brandywine. My name sake who I have yet to prove shows up in the 3rd PA Regiment in 1780…..so you never know. My 5th GGF, Squire Thomas Cheyney, (according to local historians, “the Paul Revere of the Brandywine” (on 11 Sep 1777, rode thru British lines to alert Gen Sullivan, in the vicinity of Chadds Ford, that the main body of the British army had crossed the Brandywine approaching from the North and thy were about to be outflanked at Brandywine Creek. He didn’t believe him; thought Cheyney was a spy. Cheney demanded to be taken to Gen Washington and told him to put him under guard until it was proved he could be believed. Washington finally believed him. The incident brought Cheyney into the public notice and a month later he became Col. Thomas Cheyney, sub-lieutenant of Chester Co.
That had to have been an extremely frustrating experience to know you are right and then be delayed until the usefulness of the information has expired. My ancestor was born in 1759 in England and sent with other young boys to fight for the British!! John Porter started out at a drummer in the Queens American Regiment and was at Brandywine and when the were down south he was promoted to hornblower (trumpeter) and then when back up to New Jersey to watch the prison there. In 1783 in NY he married and then went to Saint John in New Brunswick, Canada. He and a Hessian Johann Christian Fuchs built a raft and with all of their belongs and John’s wife Mary they headed up stream towards Woodstock but along the way John Porter somehow slipped of the raft and drown in Oct 1783. Then in early 1784 his wife married that Hessian and when hers and Johns baby was born in April 1784 and the Hessian tried to get John’s land grant was denied as he had a son now. Fuchs/Fox (as he called himself now) made Mary give up her baby son and as he wasn’ t going to raise that child as his. The battles are from the Archives in England and the rest was John Porter’s son as he was told by his mother and the people who raised him. Well he certainly was a low life and id lay odds if poor mary had had a chance she would have slipped him off the next. Raft. That was interesting. I was just wondering if there was a post concerning the British side when I saw yours. After all, they were there too! Thank you for sharing. My three times Great Grandfather Joseph Randall (1798-1881) made a statement at a family reunion that was in an article found in the “Bellefontaine Republican Newspaper” Ohio dated September 17, 1880 that his father told him “ When the battle of Brandywine was fought his grandfather Joseph Randall (1734-1813) was living just where the two forces met. He took his family into the cellar for safety. Mr Randall’s father Joseph Randall (1770-1839) was then six years old”. They were Quakers. I would very much like to find where exactly this land was. They say when Quakers marry the husband settles where the wife is from. His wife was Rachel Griffith. Is there anyway to confirm where exactly this location was? There are several Quaker Meetings within the Brandywine Battlefield National Historic Landmark. The Kennett Meeting, Longwood Meeting, Birmingham Meeting are but three examples. The local meetings may have records and meeting records are also held in Philadelphia where were sent from many of the local meetings. Carol, You might try Chester Co Historical Society in West Chester. They may have old maps of the area where the battle took place that show landowners. The main fighting was at Chadds Ford and Sandy Hollow. I believe Sandy Hollow is in the same family today as 1777 but I’m am not sure. If you do not live in the Phila are let me know and I’ll see what I can dig up. For all, there is in the works a Battle of Brandywine reenactment for summer of 2017. The last one was 3 years ago. It will be a major event with reenactors from all over the East coast. Also Mike Harris, author of “Brandywine”, gives comprehensive guided tours of the places where Battle events happened. He also shows where each regiment was and tells what they did. It is a special experience to walk the ground where our ancestor bravely stood and fought. It would be helpful to know the dates for the Brandywine reenactment. Once September is half over, our vacations are already set for 2017. I’m probably not the only one who has to plan that far in advance. I had no ancestors in the Battle of Brandywine, but my great, gr., gr., Grandmother Elizabeth Harry Bailey, at the age of 13, stood on a nearby hill and watched General Washington place his troops for battle in that conflict. Jedediah Lyon served in Capt. Richard Cox’s Co. in the 3rd New Jersey Regiment commanded by Col. Elias Dayton. He enlisted May 20,1777 and mustered out August 1, 1780. He was with Washington at the Battle of the Brandywine. After the defeat, Washington had his men lay over at Chester, PA while he made future plans. Lafayette, who had been wounded in the foot, was tended to by a slip of a girl in her teens, Mary Gorman, who had been called to his bedside because she spoke fluent French. Washington spent that dreadful winter at Valley Forge and Jedediah, along with many others suffered frostbite which crippled him for the rest of his life. He was sent back to his native New Jersey for the rest of his enlistment. His records show that he began receiving subsistence which was later increased after a two month leave November and December 1779 which probably indicates that he married and had a child. We lose track of Jedediah for a while and we do not know why he did, but he eventually moved south to Pennsylvania where we find him in the 1790 census in Chester, Pa with two boys and either a wife or a daughter. However, his circumstances quickly changed and in 1791, when he is 30 and she is 26, he married at Old Swede’s Church in Philadelphia, Mary Gorman, the same person who tended Lafayette’s wounds! In 1818 he applied for and received a pension, #S40106, for having his feet frozen at Valley Forge. My line to Jedediah goes back through three generations of women and then four great grandfathers. He is my seventh ggrandfather! Barbara, I am also a descendant of Jedediah Lyon! Thank you for explaining that this may have been a second maarriage for Jedediah. My family knew he was in the battle of Brandywine and married Mary Gorman but had some trouble with the ages and late wedding date. We thought we were missing a generation. I would love to connect with you about them. He is my 4th ggrandfather. My information is that Lafayette was wounded in the thigh, not the foot and it took 6 weeks to recover from the injury. I lived in chester county, pa. And Washington’s headquarters and the neardy cabin where Lafayette recovered from his injury still stand at Brandywine Battlefield park. William Popham is an ancestor on my grandfather’s side. He fought in the battle of Long Island where he personally took 19 prisoners in a very unconventional way. Washington made him an aide de camp and eventually a major as well. He was young and just out of Princeton where he graduated before entering the revolution. He also fought in the battle of Brandywine. Popham served under at least 3 generals and when he eloped his marriage was attended by several generals including Washington who gave them a tea set most of which is still in the family. Popham served as president of the order of the Cincinnati after George Washington and was the last surviving member to have fought in the revolutionary war. New York Times obituary of his son described him as a friend and confidant to many of our nations founders. LaFayette recovered in the kitchen of a house Dawesfield off of Skippack Pike in Montgomery County. This is where Mad Anthony Wayne was court martialed for the Paoli massacre (and exonerated). The building still stands and is privately owned. My 4th great grandfather Joseph Fuqua enlisted under Capt. Gross Scruggs on the 22nd day of Febuary 1776 as a private in the 5th Regiment of the Virginia line. 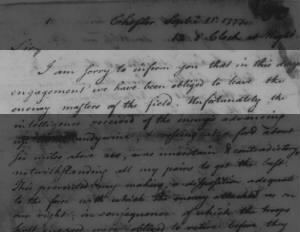 Pension Application of Joseph Fuqua W7345 Celia Fuqua VA stated that she is the widow of Joseph Fuqua dec’d of said Country-who was a private in the regular service, in the revolutionary war, and was at the Battle of Brandywine PA, Sep 1777. My 6th GG Father, Captain John Chilton, fought in the Battle of Brandywine and died on Sept 11, 1777. He fought under Col. Thomas Marshall in the 3rd Virginia Regiment. During the battle, he kept a diary of events which is a book that is published today called “They Behaved like Soldiers”. RIP Captain John Chilton and thank you for your service! Hello cousin Paula. Captain John Chilton was my 6th GG Father as well. I have a copy of the book you mentioned. I am actually related to John Chilton through two of his children, George Chilton who married Mary Ellen Ball and Lucy Chilton who married John C Ransdell. Hello Chad!!! Very nice to meet another cousin. I’m related to Captain Chilton through George Chilton who married Mary Ellen Ball and then their son George Chilton who married Eleanor Zimmerman. So, then George Chilton (Jr) would be Lucy’s brother. Very exciting! Are you on ancestry or another family history website? I am easy to find on Ancestry.com, my user name is Chad_Sidesinger. Send me a message there so we can discuss this more! My 5th GGF was Josiah Parker, Lt. Colonel in command of the 5th Virginia Regiment He was commended by Washington for his actions in the battle. Three brothers of my Carbaugh family from Lancaster County, Pennsylvania served in the Rev War. My third great grandfather Jacob Carbaugh, John Peter Carbaugh, and Samuel Carbaugh. We know for sure Peter Carbaugh served at the Battle of Brandywine Creek, Flatbush [Battle of Long Island], Battle of Fort Washington, Battle of Germantown, and Battle of Monmouth. Peter’s military service is documented by his pension application file no. S16691. His DAR database ancestor no. is A019066. He had a rank of Private. Pennsylvania Continental Line. The three brothers were sons of Simon Kerbach/Carbach/Carbaugh born 1711 Germany. The family story says that Samuel Carbaugh died while making his way home from the Rev War about 1783. Both of my Grandfather’s fought for Emperor Franz Joseph The II of Austria Hungry. I am a second generation American and proud of it. He served in the Revolutionary War at the battles of Brandywine and Germantown and received his Lieut. commision at the end of his enlistment. My 4x Great Grandfather, Micajah Pettaway (Edgecombe County, NC), was a bodyguard of Washington’s at Valley Forge and fought with Lafayaette at Brandywine…so says his 1849 obit in The Baltimore Sun. Still trying to find out more about him. Washington used my 6x great grandfather Benjamin Ring’s house as headquarters for the Battle of the Brandywine. I have a copy of an interesting document which lists a number of men captured by the British and taken to Philadelphia. My ancestor, Zachariah Wells, and I presume a number of the other men, fought at Brandywine. The sheet has a note beside one of the payees dated 22 Dec. 1780, but I don’t know if the sheet is from before that date or after. “Return of men inlisted to serve in the War in the 1st Regt. of Lt. Dragoons 5th troop which have been violently taken from the sd. Regt. These or a part of these men were later exchanged and returned to their regiment. Transcription errors are my own. Captain James Wilson 3rd Company 1st Pennsylvania Regiment is my 5th great grandfather – Thanks grandpa. Family lore is that my 5 GG, John Heaton, served under General Washington during the Battle of Brandywine. John Heaton’s son was born on the day of the battle, so he was named Washington Heaton in honor of George Washington. Supposedly Washington Heaton was born at Washington Courthouse in western Pennsylvania (suggesting that John Heaton was living in western Pennsylvania before the Battle of Brandywine). I have searched but cannot find a record on my John Heaton. My John Heaton is NOT the Colonel John Heaton who was later prominent in Greene County, Pennsylvania. Some have argued for this being the same person, but it is not. I would love to find my John Heaton. My 6th great grandfather, John Shepherd, was with the 3rd Pennsylvania batallion and was present at Brandywine. Joseph Garner (1753-1840), my 3rd G-Grandfather, enlisted in the 1st VA Regiment on 5 September 1775 and he was wounded the next spring at Williamsburg while under Capt. William Blackwell in the 7th Virginia Regiment and that John Marshall was the 1st Lieut. (later Supreme Court Chief Justice). He served the entire enlistment. He was paid 10 lbs. per annum as a pensioner. Thomas Page and John Marshall confirmed Joseph’s service record in a letter in 1819. Joseph moved from Fauquier County, Virginia in 1802 to Georgia and in 1815 he was a resident of Clarke County, Georgia. In 1818 he was 64 years old and still a resident of Clarke County. In 1820, he moved to Alabama and lived there for some time in Saint Clair County. An article in the “Tuscaloosa News”, Feb. 16, 1976 entitled “Cemetery out of People’s Mind”, Gadsden, Alabama. Joseph Garner is buried in the “Garner cemetery” in North Gadsden and his marker reads, ” Joseph Garner, Sgt. 15 Va Regt. Rev. War, 1754-1840″. The cemetery dates to the early 1800s. Joseph Garner’s grave, is on the Alabama Register of Landmarks and Heritage. 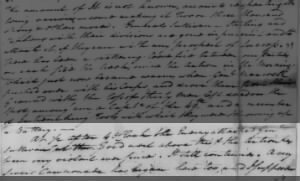 [DAR1 p. 81] and [DAR2 p. 1127] lists Joseph Garner (1754-12/20/1840 AL) m Sarah Orr and was a private in VA in the Rev. War. See also, [STEWART, entry 245]. [GWATHMEY p. 298] lists Joseph Garner as a Sgt. in the 10,11, 11 [sic] and 15 continental lines during the Revolutionary War. [BRUMBAUGH p. 438] lists Joseph Garner as a VA Sgt. who served 3 years in the Rev. War. [OWEN p. 41] lists Joseph as a private in the Virginia Continental Line and pensioner of Rev. War. [VA LINE] lists Joseph in 1835 as a sergeant in the Va Line infantry who had not received bounty land. Prepared by: James Luther Garner, Ph. D.
My 4th Great-Grandfather, William Norman was born abut 1750 in Virginia. William enlisted in the Virginia Continental Line on February 1, 1776, and served for a period of two years in the Revolutionary War. He was a private in Captain George Stubblefield’s company, 5th Virginia Regiment, which was commanded by Lt. Colonel Josiah Parker. In June 1776, he was transferred to Captain Philip Richard Francis Lee’s company, 3rd Virginia Regiment, commanded by Col. Thomas Marshall and in Brigadier General George Weeden’s celebrated Virginia Brigade. On September 11, 1777, William was dangerously wounded at the Battle of Brandywine. He was shot through both knees and was crippled for life as a result of these injuries. General LaFayette was wounded in the same battle. William Norman said that he was standing near the General when he received the wound, and that the Marquis had dismounted and was endeavoring to rally the troops at the time. By the intervention of General LaFayette in the military hospital, William Norman’s legs were not amputated; the General’s attention having been attracted “by the patient’s stubborn resistance to the surgeons.” The British bullet and a piece of bone from William’s knee were kept as souvenirs in the Norman family for some 150 years. William C. Norman recalls seeing them in his grandfather’s home (William Sheppard Norman, son of George Norman) in Hamburg, Arkansas. According to William’s daughter Sarah, William Norman always observed the anniversary of the Battle of Brandywine and celebrated it. His name last appears on the payroll on February 16, 1778. BG Charles M. Scott, Jr.
Our family had five (5) brothers, Anderson, in the Revolutionary War. The second, Brevet Major Joseph Inslee Anderson was my 3rdGGF and served the entire War in the 3rd and 1st NJ Continental Regiments. Later he was a US Territorial Judge, Tennesse Senator in US Senate and a 1st Comptroller in the US Treasury. His older brother Captain Enoch Anderson was in Haslet’s Delaware Regiment, later the 1st Delaware Continental Regiment from January 1776 on. The third brother. 1LT Thomas Anderson was in the 1st Delaware Regiment, first up north, at Battle of Long Island, White Plains, Trenton, Brandywine, Germantown and Monmouth, and then down south with General Greene and participated in more than 25 recorded engagements including Ninty-Six, Camden, Cowpens, Guilford Courthouse and Eutaw Springs. The middle brother, Inslee Anderson, was in the 2nd Delware (New Castle County) Militia Battalion. He later died in the Battle of the Wabash in 1791, sometimes referred to as St. Clair’s Defeat, well after the Revolution. The youngest brother, Ensign William Anderson was in the 1st NJ Continental Regiment during the last three years of the War. He was later a US Representative in Congress from Pennsylvania. This all wasn’t uncommon then, having five brothers in the Army was just part of the patriotism of Americans at that time. Also of note, brothers Enoch, Joseph Inslee, and Thomas served the whole time at Valley Forge when the the Continental Army was quartered there (Dec 1777-June 1778.) Four of the brothers, Enoch, Joseph Inslee, Thomas and William were all founding members of the Delaware State Society of the Cincinnati. My fifth GGF, Sgt. Hugh Heffernan (sometimes spelled Haffernan or Hafferman), served in Capt. Joseph McClellan’s company in the 9th Regiment of the Pennsylvania Line, and fought at Brandywine as well as many other places until he mustered out in 1783. He emigrated from Northern Ireland as an indentured servant before his 16th birthday, and after the war he settled on his bounty land in Venango and Crawford Counties in NW PA. He is buried in the Conneaut Cemetery near Cochranton, PA.
My 5th GGrandfather, Thomas Murray, Joined the 8th Pennsylvania of the line, Commanded by Col. Daniel Broadhead, in August of 1776 to September 1779. He was in Captain Samuel Miller’s Company. He was captured at Brandywine, escaping from the British, 8 months later. As a Frontiersmen, He took land grants in Eastern Kentucky, Dying in Johnson County, Kentucky. He was the first Murray in Ohio as A member of the 8th Penn., when they left Valley Forge, before Von Subben got there, to march on the British and their Indian alley’s, harassing their home area of Fort Pitt (Today Pittsburg), from the Ohio valley. Trying to connect with Tom Raines, a cousin of mine from the Col Thomas Marshall family. I was able to join SAR through my 4th gr. grandfather, a Quaker named Jesse Cook, b. 15 Nov 1744; d. 18 Aug 1818, who was the eighth of ten children born in Warrington twp., York Co., Pennsylvania, to Quaker parents, Peter Cooke (1700-1779) & Sarah Gilpin (1706-1783). Peter & Sarah were married 9mo. 26, 1730oc (26 Nov 1730) at Concord Quaker Meeting, Chester (now Delaware) Co., Pennsylvania. Jesse Cook (1744-1818) a tanner by trade, he was married 9mo. 24, 1767 to Mary Wierman (1746-1824) at Huntington Quaker Meeting, York (now Adams) Co., Pennsylvania. Mary Wierman’s grandfather, William Wierman (c.1695-c.1765) came to Adams County, Pennsylvania from Germany through Holland in about 1717. By 1738 William owned over 1200 acres of land in Adams Co., near York Springs in Huntington twp. Jesse Cook’s grandfather was Peter Cooke (c.1674-1713) and his wife, Elinor ‘nee Norman Cooke (c.1674-c.1727). Peter brought his family of seven children to America from Tarvin, Cheshire, England in the spring of 1713. Peter & Elinor were married 10mo. 7, 1695oc (7 Dec, 1695) at Newton Quaker Meeting, Co. Cheshire, England. Peter & Elinor Cooke, the patriarchs of the Quaker Cook family of America, were so poor that Peter needed collections from four local Quaker Meetings to make the voyage to America. Peter Cooke died during the voyage to America from unknown causes and his body was NOT brought to port. About May 1713 Elinor arrived alone in Philadelphia with seven children. Peter may have died from smallpox which would explain why his body was not brought to port. In 1778, at age 34, Jesse Cook (1744-1818) in Warrington twp., joined the York Co. Militia, 1st Battalion, 5th Company, 7th Class, No. 166,.dated April 11, 1778. As far as I can tell, the Society never gave Jesse any trouble about his service. He was never “disowned” (kicked-out) which was the standard Quaker punishment. According to 1772 tax records Jesse was on his farm in York Co., that straddled the Warrington/Monaghan township line. Today, the farm straddles the Warrington/Carroll township line. The farm was passed down my direct line for four generations to my grandfather who verbally promised the farm to his son, my father. For many reasons including distance, my father was unable to stop my grandfather’s sister from selling the farm out of the family in 1953. From 1772 to 1953, for 181 years the same family built, owned and worked this 100 acre farm. My ancestor,John Lutsey or Lutz was a Hessian soldier sent over by the British. He was captured or deserted. Later settled in Luzerne Co. PA. I was wondering if he was in this battle.